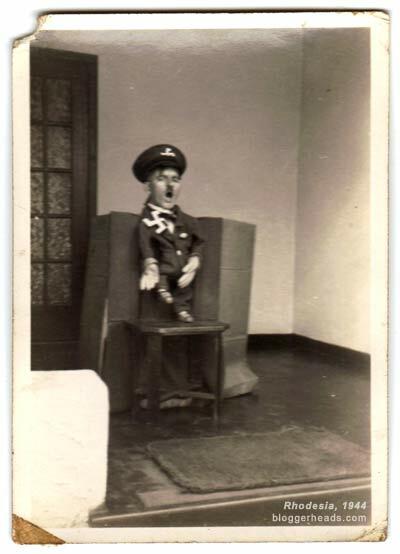 This is a photo from a friend’s private collection. I hereby dedicate this scan to all the little Hitlers of the world. Bless them, their ickle jackboots, their adorably unsteady goose-stepping, and most of all their dream of not only annexing the sandpit, but (one day) the entire playground. 5 Responses to "Hello to all the little Hitlers out there"
Great picture. Are you getting BNP'd yet by all their fans emailing you madness? "Are you getting BNP'd yet by all their fans emailing you madness? "I never get that. I almost feel left out – everyone else gets weird bile when they post about the BNP, I lay into Barnbrook all the chuffing time, get more visitors over the last couple of days when I've been slagging off the beeners than I ever get, and there's not a single weird rant in my inbox or in the comments.Maybe it's because my email address isn't on the front page. Maybe it's because they've worked out where I live and I'm going to face a kicking on my doorstep from some thick necked goon who's 'not in the BNP – honest' and they want to pretend they were never interested in the first place.Gulp. 5cc:It's a blessing, seriously, they are a mad bunch. I actually and foolishly went to meet one, he didn't show but I soon relaised what a terrible error I'd made by putting myself at risk meeting a possible racist maniac in a public place. Too many bloggers out there at the present saying' don't worry' or 'it's just a protest vote'….der Griffin is a threat even if of negligible stature.